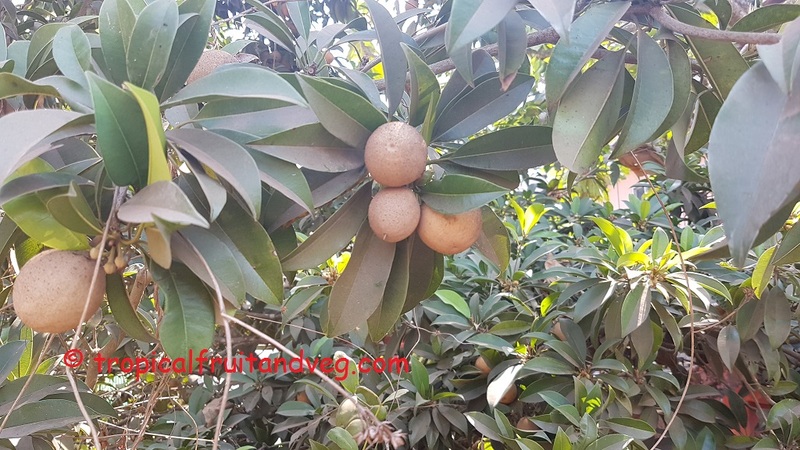 The sapodilla is a fairly slow-growing, long-lived tree, upright and elegant, distinctly pyramidal when young, growing to 18 m high in the open but reaching 30 m when crowded in a forest. It is strong and wind-resistant, rich in white, gummy latex. Its leaves are highly ornamental, evergreen, glossy, alternate, spirally clustered at the tips of the forked twigs; elliptic, pointed at both ends, firm, 7-11 cm long. Flowers are small and bell-like. The fruit may be nearly round, oval, or conical; varies from 5-10 cm in width. When immature it is hard, gummy and very astringent. Though smooth-skinned it is coated with a sandy brown scurf until fully ripe. The flesh ranges in colour from yellowish to light- or dark-brown or sometimes reddish-brown; may be coarse and somewhat grainy or smooth; becomes soft and very juicy, with a sweet flavour resembling that of a pear. 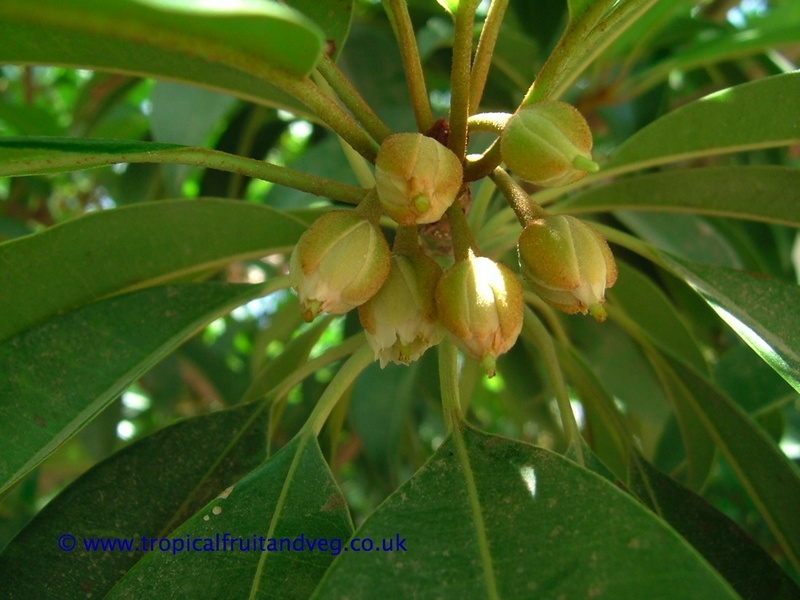 Some fruits are seedless, but normally there may be from 3 to 12 seeds which are easily removed as they are loosely held in a whorl of slots in the centre of the fruit. They are brown or black, with one white margin; hard, glossy; long-oval, flat, with usually a distinct curved hook on one margin; and about 2 cm long. 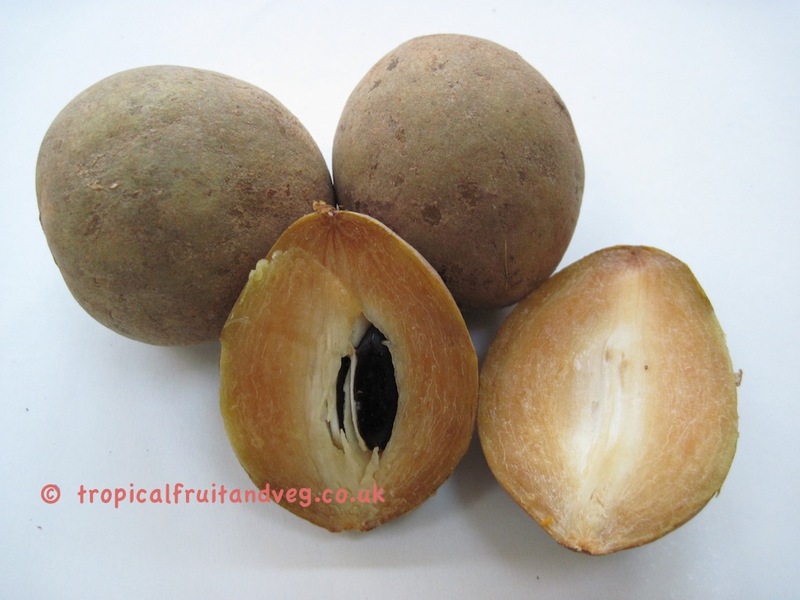 Generally, the ripe sapodilla, unchilled or preferably chilled, is merely cut in half and the flesh is eaten with a spoon. It is an ideal dessert fruit as the skin, which is not eaten, remains firm enough to serve as a 'shell'. Care must be taken not to swallow a seed, as the protruding hook might cause lodging in the throat. The flesh may be scooped out and added to fruit salads. 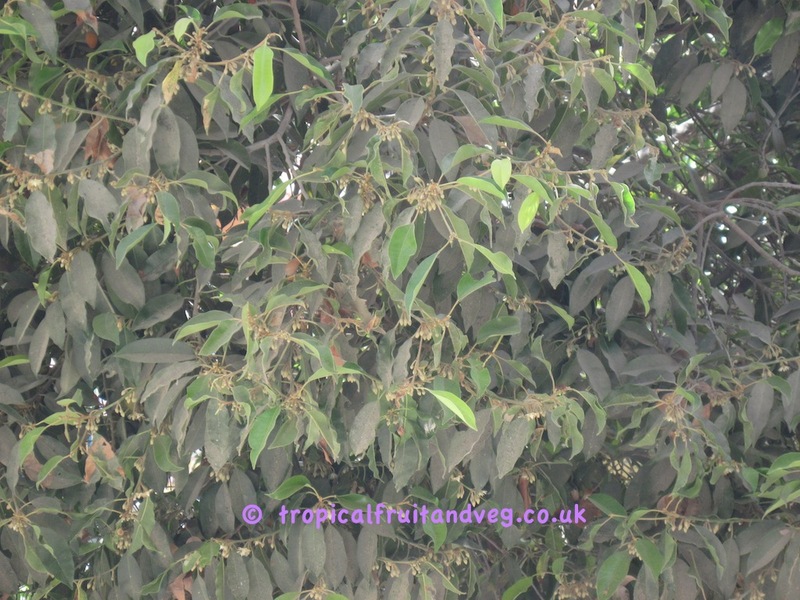 Sapodilla flesh may also be blended with ice and/or milk for a refreshing drink. 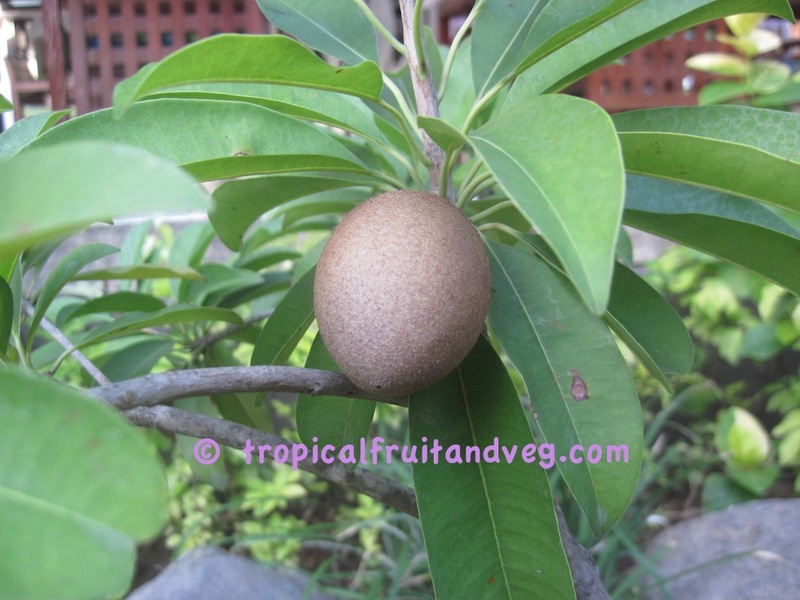 The sapodilla is not strictly tropical for mature trees can withstand temperatures of -3�C for several hours. Young trees are more tender and apt to be killed by 0�C unless the stem is banked with sand or wrapped with straw and burlap during the cold spell. 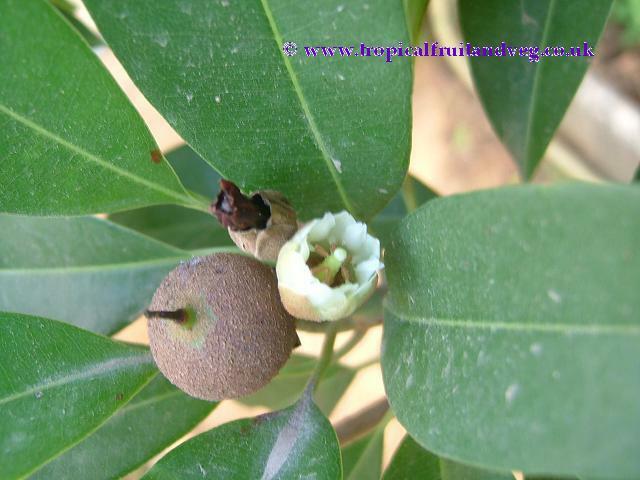 Sapodilla does need plenty of warmth and light to grow successfully. 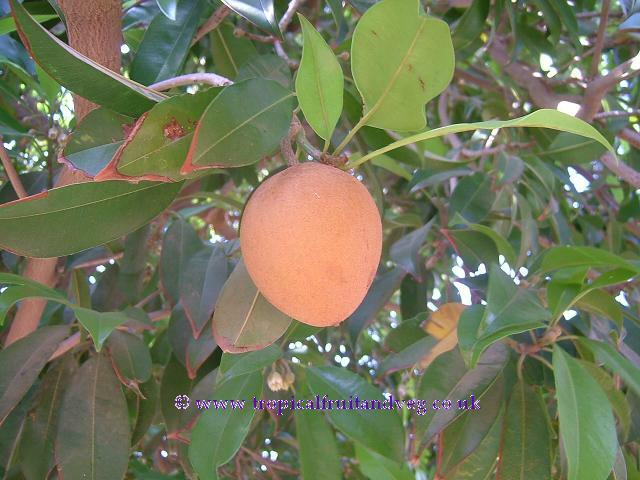 The sapodilla grows naturally in the calcareous marl and disintegrated limestone of its homeland. Nevertheless, it flourishes also in deep, loose, organic soil, or on light clay, diabase, sand or lateritic gravel. Good drainage is essential, the tree bearing poorly in low, wet locations. It is highly drought-resistant, can stand salt spray, and approaches the date palm in its tolerance of soil salinity. Seeds remain viable for several years if kept dry. 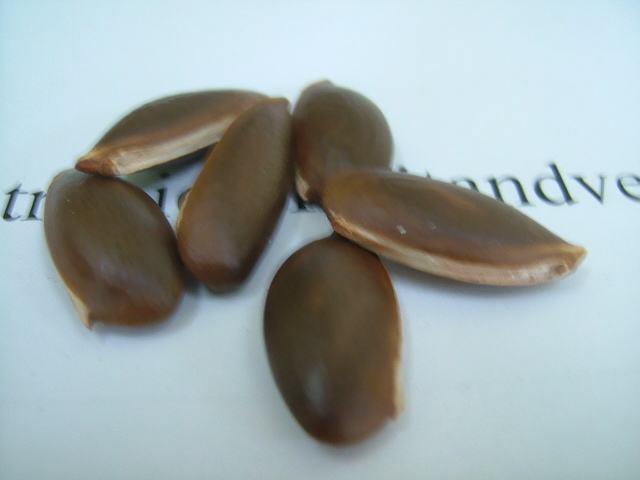 The best seeds are large ones from large fruits. They germinate readily but growth is slow and the trees take 5 to 8 years to bear. Since there is great variation in the form, quality and yield of fruits from seedling trees, vegetative propagation has long been considered desirable but has been hampered by the gummy latex. In India, several methods are practiced: grafting, inarching, ground-layering and air-layering.